Goal setting is one of the most commonly discussed topics in the realm of personal development. I’m very much into goal setting and I know how powerful it is. If you are yet to set any goal, you should. Stop living your life like a lost sheep following wherever the crowd brings you, live your own life today. 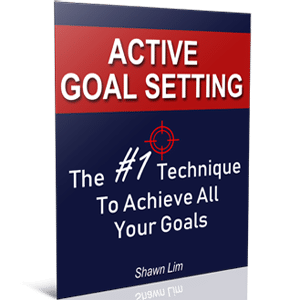 You can always learn more about goal setting from this blog. I have a whole category on goal setting. Do you know that when you set goals, your goals will direct how you live your life? Imagine going through a weekend with no particular aim in mind, how would you go through the day? Well, most likely you will wake up late since it is weekend and you have nothing to do. After you wake up, you probably check updates on Facebook. And maybe you will watch TV and have late breakfast. In the afternoon, you may end up sleeping because there’s nothing to do. You feel bored. Or maybe you will end up hanging with your friends or playing games or watching movies. This is what happens when you don’t have a clear direction or goals in life. Things will be different when you have goals. For example, if your goal is to lose some fat and to improve your knowledge in your career, you will go through your weekend totally different. You might wake up early to hit the gym or go for jogging. You know you want to lose fat and achieve your ideal weight. Thus, you spend less time on TV and on Facebook. And since you wake up early, you will get a good breakfast and that really give you a good jumpstart of the day. In the afternoon, you recall that you want to improve your knowledge on your career, so you end up going to nearby coffee house, enjoying your latte while reading books and doing research about your work. How’s does that sound? Felling good? A great weekend? When you have crystal clear goals in your head, you know what to do. This is why your goals will actively direct your life. Your goals tell you what to do and what to avoid doing. This is the power of goal setting, it brings you toward the things you want in your life. If you are living your life and going through each day without motivation, feeling sleepy and always seem boring, you need a goal. Why do you wake up every morning? If you don’t have a purpose in life, you will never want to wake up. You will choose to sleep as much as possible and wake up automatically without the use of your alarm. If you say that you wake up because you need to get to work or else you will be late, think about it again. Why do you go to work? Do you work because you need money or do you seriously love your work? I have seen people who go to work for the sake of working. They don’t feel motivated and they always arrive at their workplace the last minute. They leave early and they try to avoid additional work whenever possible. If this describes you, you probably don’t have a goal in your career or business. Or probably, your goals are not exciting enough. When your goals are what you truly desire to achieve in life, you will want to wake up to achieve them. Heck, you don’t even want to sleep because you can’t help but to consistently thinking about them. So set empowering goals that will excite and motivate you. You should make your goals as something you look forward to each day. You will then wake up with purpose and go through your day with satisfaction. People who go through live without having a clear direction are always getting distracted. This is because they don’t know what they want. And thus, whenever something comes to them, they will jump onto it. If you read the biographies of successful people who accomplish extraordinary results in life, you will see that they don’t live a simple life and they don’t follow the crowd. They have their own thinking and they have their own view about life. They live at their own terms and they dare to be different. Identifying your goals is just like finding the bull’s eye in the target. Once you found your bull’s eye, you can then shoot the arrow straight at it. Guess what will happen if you don’t know where your target is? You will shoot at anywhere and everywhere. You can’t focus. There is no target for you to focus on. Most people are living in mediocrity and they don’t dare to do things differently. They were told and programmed that they need to get good grades in school, and after they graduated, they need to find a stable job. While I’m not saying that this is something you should not do, but I’m suggesting you think for yourself and find out what you truly want in life. Start with goal setting. If your goals is to build a business, so be it, stop following the crowd and living like everyone else. Be yourself. This is your life and you should live it the way you want. Don’t get distracted by other people’s opinion and start living at your best. When you don’t have anything to focus on, how can you grow and improve? It is only when you have a clear and specific goal, that you will be able to get better at it. Think about it, all the professional athletes have goals to achieve. They want to win the competition, they want to be the best, they want to break the records, and they want to get into the Olympics. Whatever their goals, they have something in mind that they want to achieve. And because of their goals, they work harder and train to get better each day. It is extremely difficult to go through the tough training without having a clear goal in your mind. It is the same in any business or career. If you want to improve and get better results, you must have a goal to hit. How much money do you want to make in 2017? How much sales do you want by the end of this year? How many clients are you going to talk to? If you don’t have a goal, you will never bother measuring your progress and results. People who strive to get better each day are people who have clarity in what they want out of their life. Always remember this, “Clarity is power”. And clarity starts by identifying your goals. What do you want to achieve in your life? Set your goals, be clear and specific with what you want, and you will become better because you are moving in the direction that you desire. This is very common. Your goals will motivate you and drive you into taking action when you think about them. Unfortunately, most people’s goals don’t drive them, why? The answer is that their goals are NOT exciting enough. They don’t feel like achieving their goals. To them, whether they achieve their goals or not is not a matter of life and death. It is fine if they don’t achieve their goals. When your goals don’t matter to you, well, guess what, you will never bother about them either. You have to set a goal that is what you truly want in your life. You have to be serious and treat your goal as something sacred. You have to protect it and never let anyone steal or talk you out of it. I have seen a lot of people set goals as to how much they want to earn, but whenever things get tough, or whenever other people tell them it is impossible, they tend to lose faith and give up. Set a goal that is what you truly desire. Set a goal that will empower you. Set a goal that will drive and make you jump out of bed each morning. Set a goal that will motivate you and make you think about accomplishing it every moment. When your goals are empowering and exciting to you, you will never run out of motivation and energy. I believe that no one is lazy. They just don’t know how to channel their energy and motivation into the right place. Some people are able to wake up extremely early each morning to play golf. Some people are able to stay motivated until late night to watch their favorite drama series. Everyone can be motivated when they know what are the things that empower and drive them. You just need to identify your hot button and set your goals around it. What will you do when you don’t have a plan? Well, you will do whatever that comes into your mind. You will be reactive instead of proactive. Successful people are proactive and they go ahead and make things happen. On the other hand, mediocre people who don’t know what they want will do things based on their reaction. When there is something you are looking to, you will be more committed to do it. You will have the accountability because it is something that you have promised yourself. This is especially true when you have made the public commitment. Imagine your goal is to lose weight and you tell your friends that you are going to hit the gym five times a week. And if you did not achieve your ideal weight by the end of the month, you will give all your friends $100. Do you think you will have the accountability and commitment to workout in the gym? And commitment comes from setting a clear and specific goal. Before you can be committed to take the shot, you must first identify your targets; crystal clear targets. Thoughts are things. Whatever you focus on and think about all the time, you will get it. This is how the Law of Attraction works. I love to share the story about Jack Ma. He said that there was once his wife told him that he did not belong to her, he belongs to Alibaba. And Jack agreed. Jack Ma said that he is so obsess with growing his business that he can’t help but to keep thinking about the business at every moment. When he eats, when he drinks, when he walks, when he takes bath, etc, he can’t stop thinking about his business. Do know why successful people are successful right now? So what do you talk about most of the time? Stop reading and ponder about this for a moment. What did you talk to your friends or colleagues or your spouse just now? What thoughts do you hold in your mind constantly? Remember, your thoughts become your life. If you always think about having not enough money, then it will happen in your life. You will feel like having no money all the time. And to change the situation, you must first change your mindset. Think about something which is more positive and better. Think about how lucky you are, how good you can be, and how wonderful your future can be. When you change your thoughts, you change your action. When you change your action, the results will change and so with your life. Therefore, goals allow you to live the life you want. Set empowering goals that will drive you forward, and you will become unstoppable. So you know the benefits of goal setting. What should you do now? Take out a piece of paper, write down all the goals that you want to accomplish. You can follow Jack Canfield’s advice of writing 100 goals to achieve in your life. And then narrow down and focus on just a few goals that are truly important to you. It doesn’t matter how many times you have wrote down your goals. Repetition is the key to mastery. If you are reading this right now, I suggest you practice active goal setting; that is, to write down your goals everyday. You can call it daily goal setting if you want to. The more you do it, the better you will become and the more you are aware about your goals. You will then program your goals into your mind. You inject the ideas of what you want to achieve into your subconscious mind. When this happen, things will become automatic. You will develop habits to take action and move toward your goals. This is how extraordinary people achieve extraordinary results in life. However, it all starts from having a clear and specific goal that will motivate you in life. So do it right now. Set your goals. Remember to share this post to enlighten others too.